Here's Mindi working on her fish design during an Artichoke Mosaic Workshop. She's making a wall-hanging for her home with vitreous glass tiles which come in vibrant colours - ideal for a bright tropical fish. Mindi is using a pair of wheeled nippers to cut the tiles and pva glue as an adhesive. 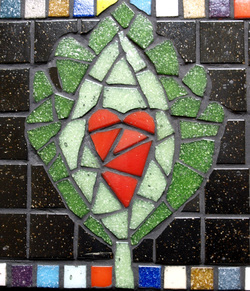 For more information and details about mosaic workshops with Artichoke please visit my website. 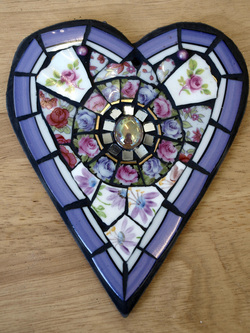 Here's a Valentine's heart to all of you who have supported and encouraged me over the years. You've been fab and I really appreciate all your kind words - and your many purchases too, of course! I hope everyone is enjoying their very own Valentine's day in their own special way. Prompted by the arrival of 2014 I decided to create a new website for Artichoke and here it is. Still in it's infancy but I'm hoping to keep adding to the site and updating it with photos and news. 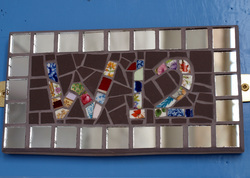 As well as website building I've been busy in Studio W12 designing and creating new stock as well as ordering tesserae and various materials from my favourite online supplier - Mosaic Trader.